Albania : When and where to go? The climate is decidedly Mediterranean throughout the whole of the coastal area with hot summers tending towards heat waves. Winters are rainy but mild in temperature with very agreeable mid-seasons. It tends to be more continental in the mountainous zones: The temperature differences are especially marked from one season to another and the north-east of the country experiences harsh winters with frequent snow. The best times to visit Albania are the months of May, June and September. 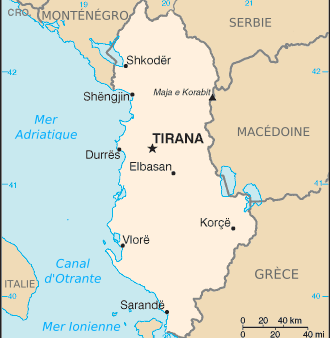 You can reach Tirana by plane via Austria or Italy. You do not need a visa if you are coming from a country within the European Union. The currency used is the lek. You will not need to plan for a large budget: A reasonable double room will cost less than €50 and you can eat well for €5. Concerning health, avoid drinking tap water and watch out for gastro-enteritis which occurs frequently. Note: Water cuts and electricity blackouts are fairly frequent and can disturb your daily comfort.